LASIK has been around for decades. Thankfully, like some of the other procedures we’ll discuss, the technique has been improved thanks to advancements in technology and our understanding of the eye. Now, the key steps of the procedure can be performed entirely by laser. This allows for a degree of accuracy and precision that was never possible before. To fully understand how LASIK works, it helps to first understand Myopia (nearsightedness) and Hyperopia (farsightedness) as well as Astigmatism and Presbyopia. In a “Normal” eye, a beam of light is focused by the Cornea (front part of the eye) and Lens to a single point on the Retina (back part of the eye). This allows clear vision. However, if a patient has Myopia, Hyperopia, or Astigmatism, light is not focused onto the Retina. Here is a diagram from eyeglassguide.com illustrating this concept. Here we’ll use Myopia as an example. 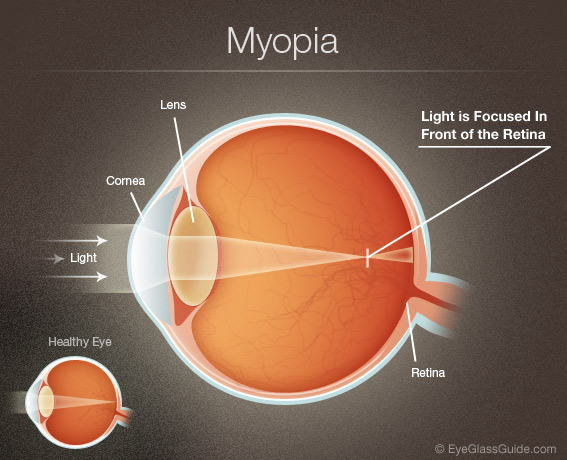 As you can see from the diagram, a light beam is focused to a single point in front of the Retina in Myopia. This causes blurred vision in patients with Myopia. I won’t include diagrams for Hyperopia and Astigmatism here, but you can read more about these conditions and view helpful diagrams in their respective sections. The take home message here is that all of these conditions interfere with the ideal condition of light being focused to a single point on the Retina instead of in front or behind it. LASIK (and a few other refractive procedures) fix this problem by re-shaping the cornea so that light can be focused onto the Retina, as it should in a “Normal” eye. Thus, LASIK returns the eye to full functionality and eliminates the need for glasses or contact lenses! The key steps in LASIK can now be performed exclusively by laser. This allows for improved precision and even better results. Before it begins, patients are counselled on exactly what to expect so there are no surprises. First, a femtosecond laser is used to create the LASIK flap. Afterwards, an excimer laser re-shapes the cornea based on precise calculations. Both of these lasers were developed specifically for LASIK and help us achieve the best results. Pros: Patients notice improved vision immediately after having LASIK. This effect only gets better as the eye heals. Many people describe LASIK as “life-altering” once they are able to see the world in perfect clarity without assistance for the very first time. Patients may then say good-bye to the negative aspects of wearing eyeglasses. These include blocked or distorted peripheral vision, scratched lenses, and difficult bifocal/progressive segments. Contacts provide better peripheral vision, but come with their own set of problems. Contact lenses decrease the amount of oxygen that reaches the surface of the eye. On top of that, they interfere with the ability of our own tears to naturally remove toxins, allergens, and bacteria from the eye. Partly because of this, contact lenses cause higher rates of potentially blinding eye infections, allergic reactions, and dry eye. Cons: Every procedure has risks. While LASIK is very safe, it should not be performed in patients with specific eye diseases. Therefore, it is very important to see an Ophthalmologist who will do a thorough examination and various screening tests to ensure a patient’s eyes are healthy enough to have LASIK. Once the examination and tests are complete, it is also important for patients to listen to the risks and details of the procedure so they can make an informed decision. While there are many reasons why patients want LASIK, the most common reason for holding off is cost. I recently attended a lecture which talked about the cost savings from refractive surgery and thought it would be helpful to share. Varies by provider but is approximately $2000 per eye or $4000 for both eyes. Over the course of 15 years this adds up to $3000. Over the course of 25 yrs, the cost has already exceeded the price of LASIK. With this incredibly basic cost analysis, it is obvious that LASIK may actually save money in the long run. With that said, no decision that could potentially affect your eye health (or any health for that matter) should be made on the basis of cost. While LASIK is a wonderful procedure, it is imperative that you have a thorough eye examination with a trusted Ophthalmologist to ensure that you are a good candidate. Thank you for how you have explained everything! The cost-analysis was very eye-opening. Great work Dr. Vish.